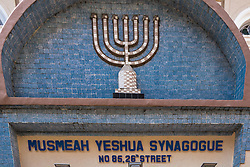 Musmeah Yeshua Synagogue is the last remaining Jewish house of worship in Downtown Yangon and Burma's only synagogue. The synagogue stands nestled between Indian paint shops and Muslim traders on a small street near the city centre. 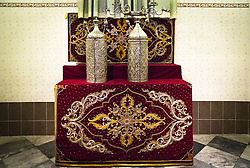 It serves the few remaining Jews of the country - mostly descendants of Sephardic Jewish Iraqis. 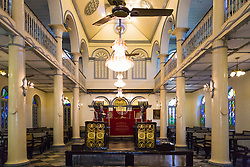 The synagogue was built for the increasing numbers of Baghdadi Jews from the Middle East, and Bene Israel and Cochini Jews from India arriving during Burma's Colonial era. The plot of land was granted by the British Colonial Government and following Burma’s independence, an extension was granted by the Burma authorities. Before the outbreak of the Second World War, the community numbered 2,500 persons. Many Jews left due to the Japanese occupation and more followed after the Burmese army seized power in 1962 where most businesses were nationalised in the 1960s and 1970s. The community once had 126 Sifrei Torah. 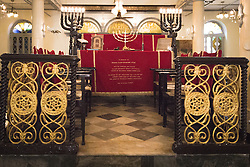 A second synagogue, Beth El, was opened in 1932, and some 700 graves are found in the well-kept cemetery on 91st Street. During Cyclone Nargis in May 2008, the synagogue lost its roof and sustained water damage. The current Jewish population of Myanmar, including Yangon, is less than 19, with Moses Samuels having died on May 29, 2015, in Yangon. Surviving him are his widow, Nelly and his children Samuel "Sammy", Dina and Kaznah Samuels.